Super Typhoon Meranti captured by NASA’s Aqua satellite. Super Typhoon Meranti is careening past the southern tip of Taiwan, packing sustained winds of 185 miles per hour. The cyclone has logged wind gusts as fast as 225 miles per hour, and waves as high as 48 feet. 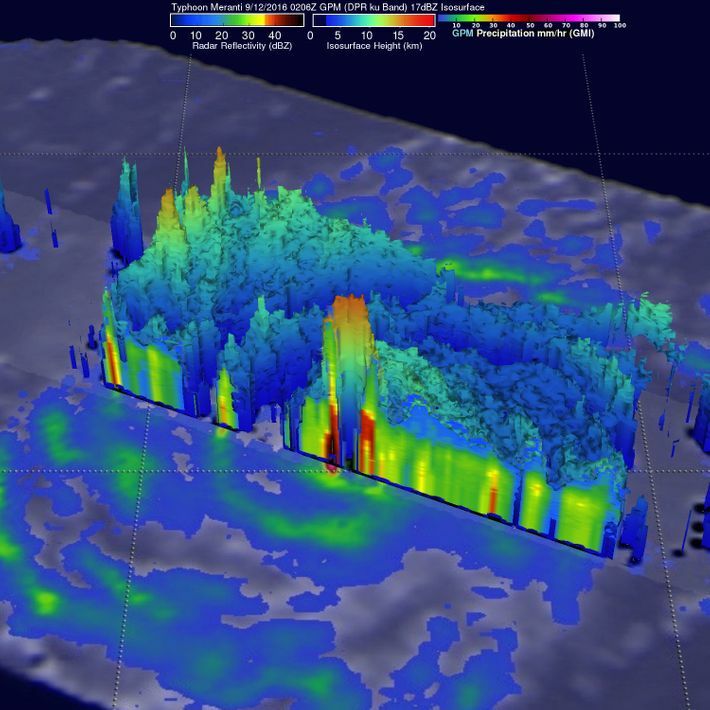 Parts of the system were dumping nearly a foot of rainfall per hour. Meranti is the largest storm on Earth right now, and one of the most impressive cyclones ever recorded on the planet. 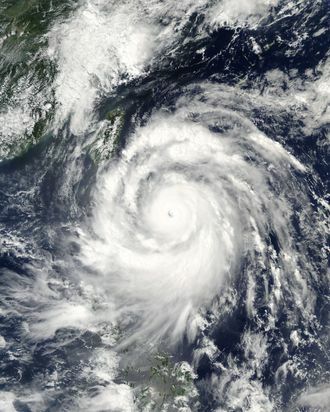 Only two other super typhoons have managed to maintain wind speeds at 185 miles per hour for 18 hours: 1979’s Typhoon Tip, the most powerful storm in recorded history; and 2013’s Typhoon Haiyan, which killed more than 6,000 in the Philippines. Forecasters predict that Meranti will skate south of Taiwan on Wednesday, avoiding a direct hit, but still battering the island with tropical-storm-force winds and heavy surf and torrential rains, which could produce mudslides in its mountains with rainfall anywhere between 10 and 30 inches in some spots. But Meranti poses an even bigger threat to China’s southeastern coast. The cyclone is charging forward south of Xiamen, a port city in the Fuijan province, and even if the storm weakness — and it likely will — it will approach mainland China around Thursday with the equivalent strength of at least a category-three hurricane. That means winds up to 129 miles per hour, intense downpours, and deadly surf. This will likely be the second deadly storm hit for this region in just weeks. 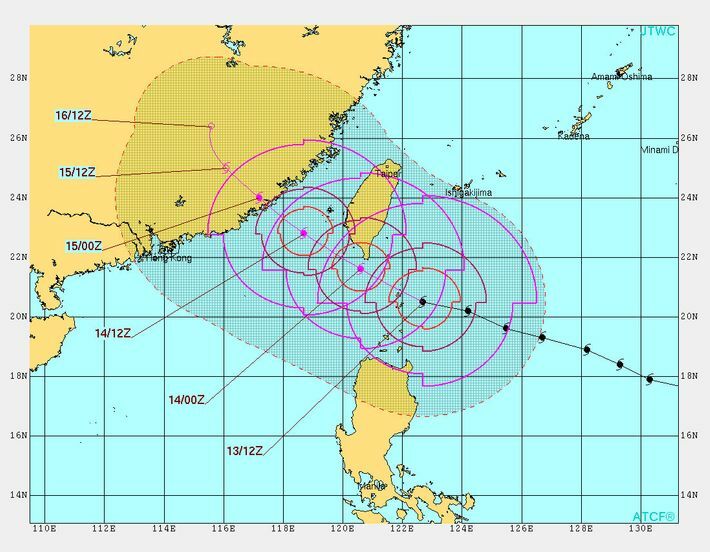 In July, Typhoon Nepartak took a path similar to Meranti’s, killing 3 in Taiwan and more than 80 in mainland China as a tropical storm. In one Taiwanese town on the southeastern coast, residents rushed to repair still-damaged homes as they prepared for another, more fearsome storm to arrive.